Enjoying the outdoors lifestyle is one of the appeals of owning a log home. But for many urban transplants or weekend naturalists, it’s important to maintain good stewardship of the forests and waterways that surround your log home. One of the biggest threats to healthy forests and water habitats are invasive species. These plants and insects are spreading through many regions of North America, by both natural and human transport. We spoke with two invasive species experts here in Maine and they offered some tips on how to keep your environment free of some of these species. In Maine, the top insect invasive species include the emerald ash borer (above right), the Asian longhorn beetle (below) and the brown spruce longhorn beetle. Descriptions of telltale signs of the insects and where to look are detailed on the Forestry Service’s website. 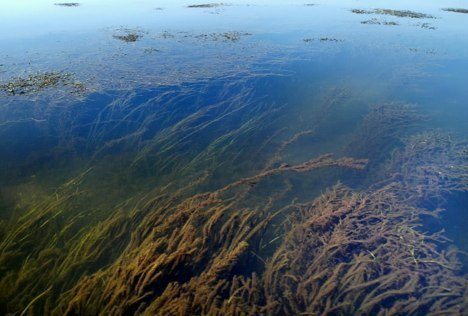 For Maine waterways, Eurasian and variable milfoil are two highly aggressive species that can choke off native species in lakes and rivers. Pictures and descriptions of invasive plants are available on the DEP’s website. Many people don’t realize the very real costs of invasive species. According to Paul Gregory from Maine’s Department of Environmental Protection Invasive Species Program, Florida spends $20 million each year just to clear one invasive species, hydrilla, from its navigable waterways. Hydrilla was introduced to North America as an interesting and fast-growing aquarium plant in the 1950s and it now infests wide areas of the southeast. Other invasive aquatic plant species threaten the water quality of lakes and ponds that supply fresh drinking water to nearby towns and cities. Invasive insect species work their way through hardwood and softwood forests destroying trees. Damage to mature forests can cost millions of lost dollars to the industries relying on trees as a resource to produce lumber, paper and other products, as well as tourism which relies on pristine forests as an attraction. Certain areas of the northeast and Canada are under quarantine for specific wood species likely to harbor invasive species to prevent further infestation in unaffected forests. On a more personal level, consider how the curb appeal of your log home might be diminished if you lost your ash, spruce, hemlock or oak trees all at once. For the most part, these invasive species find their way into new environments through human transport. Once established, they can grow and spread more rapidly than in their native environments because they have fewer or no competition or natural enemies to keep their growth in check. For insect invasive species, Allison Kanoti, Forest Entomologist for Maine’s Forestry Service, the best preventative is to avoid moving wood, especially firewood, from one distant area to another. “Insects are not easy to find and many are in place long before we are able to identify them within the trees.” Since many outbreaks of new invasive species in Maine have been found to occur around campgrounds, Kanoti recommends that residents and visitors not transport firewood to their camp or vacation home. She even recommends that year-round residents offer seasonal visitors the option of purchasing a supply of their own local firewood as a preventative measure to protect the surrounding woodlands. In Maine, a new law enacted in April of this year directs forest service personnel to restrict the movement and importation of firewood in Maine. If an infestation of one of these invasive insects is located, Kanoti said that the forest service will act to try to prevent its spread by removing the affected trees from the area. According to Gregory, invasive aquatic plant species are much easier to spot and prevent. Boat owners, fishermen and other water enthusiasts need to take a moment to inspect any boats, clothing, gear and even fishing lures for any bits of vegetation that might be present before use in a new location. The Preserve Maine’s Waters program, commonly referred to as the “milfoil sticker,” combats invasive milfoil species by assessing a fee ($10 for residents, $20 for non-residents) for boats used in Maine waters. The resulting fund, presently about $1.2 million, is used for DEP eradication and Forestry Service enforcement in locating and identifying invasive aquatics. Gregory said that residents who spot an unusual plant are encouraged send a sample to the DEP for analysis and identification. Many of the infestations in Maine have been identified through citizen action. For more information on the invasive species that might be encroaching on nearby forests or waterways, a good place to start is the National Invasive Species Information Center. Maine hosts a very descriptive site for invasive threats to Maine’s forests and trees within the Forest Service website. Check with your state’s Forest Service, Fisheries, Wildlife or Environmental Protection agencies for information specific to your area.